Since the early 1990s when the nation's first charter school was opened in Minneapolis, the scope and availability of school-based options to parents has steadily expanded. No longer can public education be characterized as a monopoly. 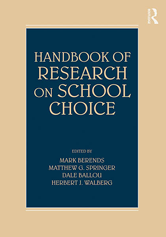 Sponsored by the National Center on School Choice (NCSC), this handbook makes readily available the most rigorous and policy-relevant research on K-12 school choice. Coverage includes charters, vouchers, home schooling, magnet schools, cyber schools, and other forms of choice, with the ultimate goal of defining the current state of this evolving field of research, policy, and practice.